2,5-Furandicarboxylic acid (FDCA) has garnered worldwide commercial interest as a bio-based, renewable monomer for the production of polymers and resins. The monomer has emerged as potentially promising for chemicals manufacturers for the production of bio-based plastics, for it can replace terephthalic acid (TPA) and various other petrochemicals for the production of plastics, such as PET. FDCA has been frequently been considered as an intermediate for the production of polyethylene furanoate (PEF) polymers and PET plastic bottles. A substantial thrust for the demand for FDCA comes from the packaging industry for the production of bio-based plastics and from beverages industry for the production of carbonated soft drinks. Intense industry search for environmental-friendly plastics, supported by large regulatory thrusts in several countries, has been imparting constant momentum to the growth of the FDCA market. The global 2,5-Furandicarboxylic acid market stood at nearly US$300.0 million in 2016 and is projected to expand at 8.2% CAGR during the forecast period of 2017–2025. Rapid expansion of production capacities by chemicals companies, world over, is contributing to the attractive expansion of the market. Ceaseless research and development activities on leveraging the bio-based properties of FDCA are likely to create lucrative avenues for these companies. The various applications of 2,5-furandicarboxylic acid can be categorized as polyamides, polyesters, plasticizers, polycarbonates, and the others segment. Of these, polyesters is anticipated to lead the pack throughout the assessment period. The vast application of FDCA is attributed to its demand in the synthesis of renewably-sourced polyesters as the monomer replaces TPA. The properties of biocompatibility and biodegradability makes FDCA as the material of choice for making polyesters such as PET and polybutyleneterephthalate (PBT). The promising application of FDCA in the production of bio-based plastics has made the compound of immense commercial value in the packaging industries, world over. The application is bolstered by growing shifts of governments in several nations toward bio-based plastics to combat the burgeoning problem caused by plastics pollution. To this end, governments have also been active in providing incentives, notably offering tax rebates, to chemical companies for the production of green packaging. Growing consumer awareness about the mounting concern of inadequate disposal of bioplastics has also been a potential force driving the applications of FDCA in the production of environmental-friendly plastics. The rising demand for bio-based and sustainable packaging in various parts of the world is fueling the use of FDCA in various bio-based applications. Furthermore, frequent fluctuations in the prices of petrochemical used in the plastics manufacturing industry has also substantial prospects in the FDCA market. The various regional markets for 2,5-Furandicarboxylic acid are North America, Europe, Asia Pacific, the Middle East and Africa, and Latin America. Of these, both North America and Europe held substantial shares in the global FDCA market in 2016. Reiterating focus of the regulatory agencies in the European Union on bio-based or green procurement policies in the chemicals industries has been a crucial factor reinforcing the demand for FDCA. Coupled with this, widespread consumer awareness about environmental friendly products in various developed nations of Europe is supporting the attractive expansion trajectory of the Europe market for FDCA. The demand for FDCA is rapidly rising in Asia Pacific and the regional market contributed a promising revenue share in the global market. The burgeoning demand is supported by the swift pace of industrialization in several of its economies. Moreover, changing consumer patterns are tilting toward bio-based alternatives in the chemical manufacturing industries across the region are spurring the demand for FDCA. A case in point is the burgeoning demand for FDCA in China. The usage of bio-sourced PET products in the packaging industries in the country is contributing substantial revenues in the regional market. Meanwhile, the Middle East and Africa (MEA) and Latin American are projected to rise at a rapid pace during the assessment period. 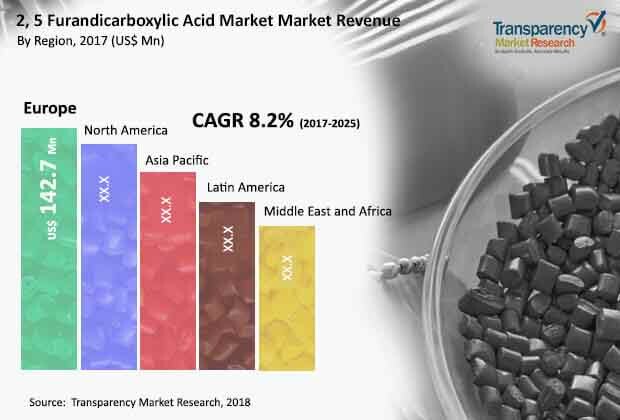 Prominent companies in the 2,5-Furandicarboxylic acid market include V & V Pharma Industries, AVALON Industries AG, Chemsky (Shanghai) International Company Limited, Novamont SpA, AstaTech Inc., Synvina, Alfa Aesar GmbH & Co KG, Toronto Research Chemicals Inc, and Corbion NV.